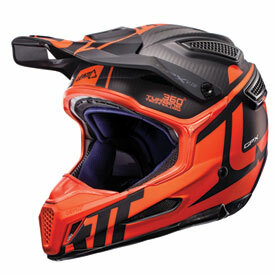 The Leatt GPX 6.5 Carbon V16 Helmet redefines head and neck protection. A company renowned for safety gear, Leatt has finally released its own off-road helmet. Rather than stick the Leatt name onto a design that is similar to existing ATV or motorcycle helmets, the GPX series of helmets adds innovative new protective features. But of course, would you expect anything less from Leatt? The GPX 6.5 helmet features a carbon matrix shell with an innovative V-Foam EPS (expanded polystyrene) liner enhances the helmet's protection while keeping it smaller than competitors. The smaller shell size allows the Leatt helmet to attain new levels of lightness – an important feature for a helmet as it both increases the rider's comfort but also decreases the rotational energy delivered to the head and brain in a crash. Leatt has introduced other cutting-edge features as well. For example, the 360° Turbine technology offers two important helmet protective measures. It allows the helmet to absorb more force from a low-energy impact, but it also combats rotational energy as well. 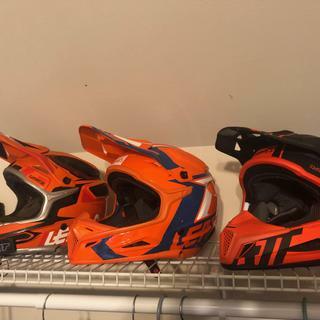 In fact, one of the ways that the Leatt GPX helmet line sets itself apart from other ATV and dirt bike helmets is the reduction of rotational acceleration. Of course, Leatt has also taken great care to design a helmet with comfort in mind in addition to safety. That's why the GPX helmet features an impressive ventilation system with an innovative design that allows for great airflow. The helmet is also built to accommodate other great Leatt gear, including the legendary Leatt neck brace as well as hydration packs. There are no doubts about it. 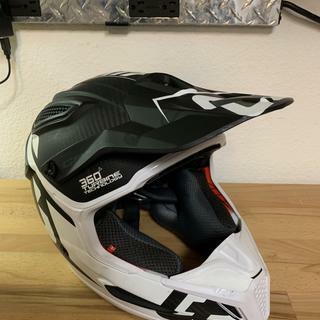 If you are looking for a helmet that features the latest safety technology in an attractive and comfortable package, the Leatt GPX 6.5 V16 helmet is for you. - Multi density V-shaped impact foam molded to the outer shell. For proper fit and size of your Leatt helmet, measure the circumference of your head 1" above your eyebrows and around the largest portion of the back of your head. Very nice helmet. Little spendy but put a value on safety and comfort? Well worth the money. As usual Rocky Mountain had the product, quick service all around good experience with my purchase. Thanks RM!! Awesome helmet super lite comfortable and cool. Exactly what they said I was getting and received it when they said I would. My first dirt bike helmet. I went in knowing that the helmet is probably the most important piece of safety equipment. 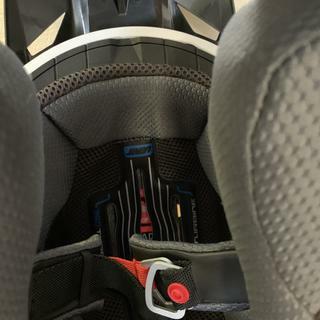 Leatt stuck out to me as above the rest with it's safety features. Overall the reduced size and weight are noticeable right out of the box. This helmet is amazingly light. It breaths very well to. Huge amounts of venting. Highly recommend this helmet. This is by far my favorite helmet. This is my 3rd Leatt helmet and 1st Carbon fiber Leatt. I ride off-road and mostly in Texas where it can be over 100 degrees in the summer. Ventilation is 2nd to none. This is the lightest helmet I've owned and I like the option to put the hydration hose through the helmet without putting a hole through the front piece. Great fit, pretty light for the technology, vents look great and function well if you are going somewhat fast. best vented one i have owned but sometimes wish for more! but dont we all! Helmet fits great, and the ventilation is awesome especially at lower speeds. It seems like a good helmet. Hope I never find out. But for the features, it has it seems like the best money spent on quality. However; the new version is better for the cheek pad removal system. Sick lid that gets the job done! 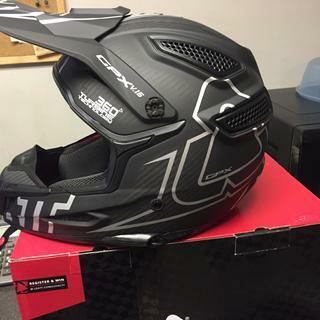 This is the first helmet I have purchased from Leatt and I must say that I am very impressed. 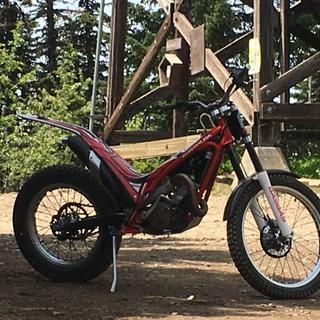 The fit is impressive, the ventilation is fantastic, and it still keeps a sense of style while combining all the safety capabilities that a good rider searches for. I will be buying more of these in the future and recommend this brand for anyone. This helmets a dime in my book! Helmet fits great on the head but the cheek pads are a bit tight. The weight of it is great and air flow is awesome. Great helmet. But seriously, one crash it’s done. This helmet is light. I find it super comfortable and it fits my goggles well. Some guys are having issues with goggle fit. Not here. The turbine feature may cause the helmet to be somewhat crooked on your head even though it feels right. Just get in front of a mirror and jerk it straight and you’re good to go. I think the liner may have been crooked from the factoria. Has all the bells and whistles of new helmet technologies. The cheek pads feel a bit tight but i am sure thats good considering it had a MIPS style liner. Common sense guys, it’s a carbon helmet. You crash with it it’s compromised. Treat it accordingly. I initially bought the 5.5 XL per the size chart I was a 24 in which was on the edge of Large and they only had an XL, but when I put it on it was to big. Called RMATV and they were out of the LG. I decided to go to the 6.5 and Lg this time. I can see a big difference between the 5.5 and 6.5 pads and liner in the hemet. The weight is roughly 3 lbs vs 2.8 between the 5.5 and 6.5 so it's all about the comfort and fit. First ride: temp 85 and humidity was really high in AZ desert near phoenix. I was sweating buckets and drank 3L of water in 2.5 hours. The helmet was awesome. Fit nice and snug, I could feel the air on my head when I was moving at 20+ mph. I noticed I wasn't getting sweat running down my face like I did with my old helmet. Took the helmet off and it was damp but not soaked. One of my friends said that has to be the most awesome helmet he's ever seen. Well have have to agree it's the most awesome helmet I've ever used and love Leatt' s products. Neck brace and cheat protector combined with the helmet feel great. This helmet has the most venting I've ever used.Even comes with some foam inserts in case you want less airflow. Enduro riders are going to love this helmet. Light weight, good looking helmet. 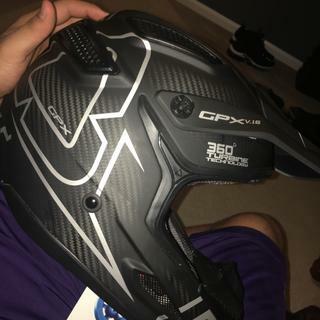 Bad boy summer helmet .fit oval shaped heads great and it super light weight a little pricey but I would buy this helmet again and again .does have a hydration hook up to . Best Helmet I have ever had and I have had a lot of them. The size was perfect and I absolutely love the size of the overall helmet its compact and it easy on the neck and head. HOW much does it weigh, medium size? Will the oakley frontline goggles fit the 6.5 GPX v16 helmet? BEST ANSWER: Hi Maverick, I am not personally familiar with the Frontline model however, the size looks very similar to the 100% Racecraft goggle which I own and they fit with this helmet. Don’t know about those specifically, but so far, I have fit two different adult size goggles into this helmet. My 7yr old son is wearing an adult small. I got my boyfriend the AIRBRAKE™ PRIZM™ MX ELI TOMAC SIG SERIES GOGGLEs , would they fit inside this helmet ? Or is the face too small ? BEST ANSWER: Hi Savannah, it will depend on the size of the helmet you are looking at. I wear an XL in this helmet and have the 100% Racecraft goggle, which is a larger frame/lens, and do not have a problem with fitment. I’m not sure. My son will not use Alias goggles with this helmet. But he likes the 100% goggles with it. Sorry, that’s all the feedback I have. Yes I have a small round head and it fits better than any helmet I have ever owned. Great feel when you have it on. 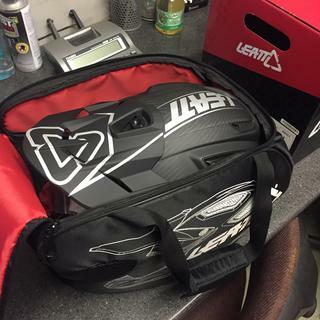 Does the Leatt GPX 6.5 V16 Carbon helmet come with a nice helmet bag? BEST ANSWER: yes. you will be happy with the helmet all around. BEST ANSWER: Hi Rafael, at 585mm I would suggest a size Large. 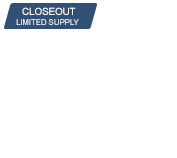 Are the older models on close out or are some the current? 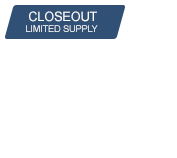 BEST ANSWER: Hi Christopher, Rocky Mountain has 2017 and 2018 models listed on closeout. 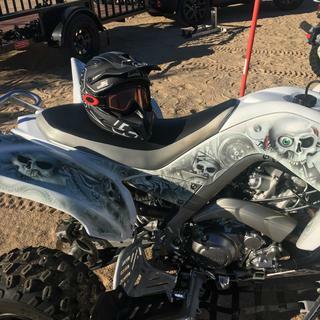 Does the GPX come with an extra visor? It has been my experience that, at one point they are going to break, and when they do it is a real pain to replace them. If not, maybe consider it. BEST ANSWER: This helmet does not come with an extra visor. Do 100% goggles fit well with this helmet ? BEST ANSWER: The 100% Racecraft goggles are probably a tight fit but the rest of the lineup should fit pretty well.